Is there life beneath the soil? "Ammonia could be the key to finding life on Mars," one US space agency (Nasa) scientist told BBC News Online. 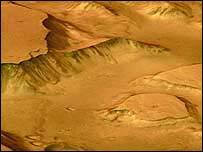 Spectral evidence of the gas was seen by the Planetary Fourier Spectrometer (PFS) on Mars Express. Professor Vittorio Formisano, principal investigator for the instrument, is expected to release details of new findings from the PFS at an international conference being held next week in Paris. The PFS is sensitive to radiation in the spectral region of 1.2-5 microns and 5-50 microns - a region rich with important molecules such as water and carbon dioxide. Ammonia has a spectral line at 10 microns. Although Mars Express has been in orbit around Mars since December 2003, scientists have so far only analysed a fraction of the data the PFS has produced. Researchers say this is because they are still coming to terms with the complexities of the PFS as well as coping with some nagging power problems on Mars Express. So far the PFS has observed a depletion of carbon dioxide and an enrichment of water vapour over some of the large extinct volcanoes on Mars. But it is the detection of minor compounds, possible in the sensors high-resolution mode, which are causing excitement. The detection of ammonia comes just a few months after methane was found in the Martian atmosphere. Methane is another gas with a possible biological origin. Ammonia is not a stable molecule in the Martian atmosphere. If it was not replenished in some way, it would only last a few hours before it vanished. One possibility the scientists had to rule out was that the ammonia came from the air bags of the failed Beagle 2 mission. Analysis revealed that the ammonia's distribution was not consistent with this explanation. The twin US rovers that landed on the Red Planet in January will be unable to answer the question of the ammonia's origin as they are designed for geological work. But future missions could include sensors to analyse the ammonia to determine if it has a biological or volcanic origin. Lava deposited on to the surface, or released underground, could produce the gas. But, so far, no active volcanic hotspots have been detected on the planet by the many spacecraft currently in orbit.